Over 4000 years ago, ancient Egyptians and Indians had used cucumbers as food and medicine. Cucumbers (Cucumis sativus) is a widely cultivated plant in the gourd family and three main varieties of cucumbers are slicing, pickling, and seedless. In oriental medicine, cucumbers have good effects on cooling bodies, help diuretic, dysentery, and edema while western medicine had proved that cucumbers help dialysis, diuretic, to soluble uric acid and urate salt, to prevent gout symptoms, antipyretic, to create sedative effect, and to treat some dermatological problems as wrinkles skin, chapped skin, freckles on skin, and reduce oil on skin. Moreover, cucumber can also nourish skin face. The smaller and greener cucumbers contain higher volume of biotin (nutrition of skin), vitamin C, and selenium than bigger ones. Vitamin C and selenium help to boost immune system and fight back infection. Therefore, agricultural scientists have encouraged farmers to maximize the amount of cucumbers rather than their sizes. The best size of a cucumber should be under 20cm. Cucumbers could be processed in medical dishes. 1. As a starter: thinly slice cucumbers; smash ginger then mixes with boiled water; drain all water and soak sliced cucumbers in. 2. Cucumber juice: 1 cucumber, 1 apple, 20g lime juice, 20g raw honey, and 1 carrot. Juice all the vegetables then mix in lime juice and honey. This juice helps improve body’s health and anti-anxiety. 3. To treat summer dysentery for children: chop 10 young cucumbers then cook them with sugar-cane honey or to cook salted pickle congee for the kids to have. 4. Soup for gout patients: core a cucumber and slice, a handful of dried mushroom, 2,5g salt, 25g sesame oil, lard and soy sauce to taste. Stir-fry mushroom then cucumber, and add all seasonings in. 5. Congee for epileptic patients: boil 50g young cucumber in clean water then add 50g wheat grains; when the grains are softly cooked, add in 15g rock sugar. 6. Dish for diuretic: slice cucumbers then cook with rice vinegar; have the whole dish. 7. Salty & sour pickle soup: 200g salty & sour pickle – diced, 200g beef – diced, 3g fresh garlic, 3g onion, 10g celeries, 5g olive oil, lime, pepper, and spices to taste. 8. Nourishing skin mask: mash 2 slices of cucumbers with 1 quail egg’s york, 1 teaspoon vegetable oil, 1 teaspoon honey; blend well and fridge. Apply on face and let it sit there from 30 – 60 minutes. Rinse well. 9. 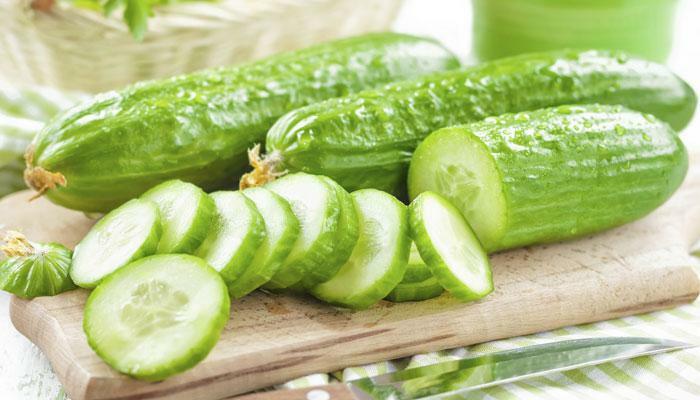 For fresher breath: cook cucumbers’ skin in clean water and drink daily. 10. To treat atherosclerosis: slice 1 cucumber and 1 tomato; mix them with salt, sugar, and vinegar as salad. 11. To treat hyperlipidemia: 250g cucumbers (slice), 50g dried mushroom (soak in warm water), oil, salt, onion, and chopped ginger root. Heat oil up and stir-fry onion and ginger; add sliced cucumbers and mushroom; add salt to taste. 12. To treat diabetes: 250g cucumbers (slice), 30g chopped garlic, soy sauce, vinegar, and sesame oil to taste. Mix everything as a salad. 13. To reduce freckles: juice a small cucumber; mix the juice with yogurt to make a natural facial cream. Apply on face in 20 minutes, twice a day. 14. To moisture and brighten facial skin: juice 2 cucumbers and 1 sweet gourd; mix the juice with enough honey to drink. Knead fruit pulp with fresh tofu to make facial mask, using once every 2 days. 15. Diet controlling: having daily vinegar cucumber salad with bean sprout, fresh ripe tomatoes, or cooked daikon. Note: Although cucumbers have massive healthy usages, we should not have too much because it can cause digestive problems. Doctors do not recommend raw cucumbers for children and patients.